"My Brother Threw-up on My Stuffed Toy Bunny"
Hmm- can you tell I'm now a parent? 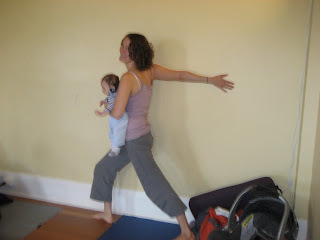 Here is a fuzzy, but fun, pic from post-natal yoga :) My friend Lea took it. 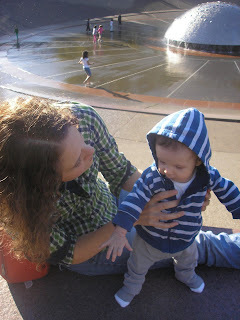 I've discovered that Ezra is taking after mommy and seems to be extroverted! 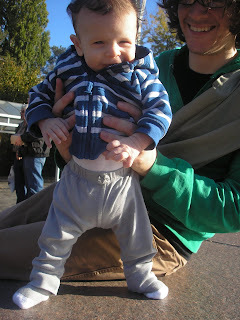 Or, at least, he's a curious baby who loves to be out and about :) As you'll see in pictures to come, he takes after his daddy quite a bit too. 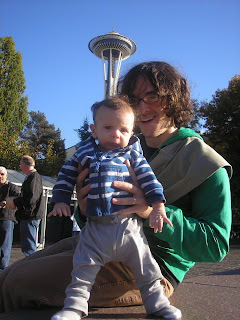 We took Ezra to Seattle Center last Saturday to enjoy the GORGEOUS fall weather. This is a picture of my new tummy technique for Ez. He loves doing tummy time if I just prop him up a little bit on a blanket. Then, he uses his arms. I think he's getting the hang of pushing himself up with his arms, so hopefully soon I'll be able to remove the blanket altogether. Here he is taking after Brendan: he's keyboard obsessed! If you've yet to receive chat or email from Ezra, just wait; you will! This is SUPER BABY! (with "Law and Order" in the background). Playing on his train blanket from some friends in 'rillo. This week was full of fun that I didn't get to take photograph. Monday, we stayed home b/c mommy had a cold. Tuesday we went to a new community mommies' group that meets up the block and learned that indeed Ezra has a TOOTH coming in! I didn't believe him, but sure enough there is a little nub pushing through. The nurse who facilitates the Tuesday group confirmed it for me. 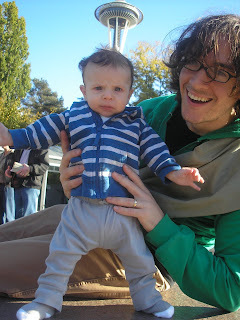 Later that day, we went to Paper Zone (which Ezra loved- so many colors!) and Pier 1 (throw pillows for $6!!!). I take Ezra out of the carseat every chance I get now. He has way more fun when I hold him stores so he can flirt and look at everything. He's grown up so much that he no longer pitches a giant fit when he gets in the seat! Thank God! 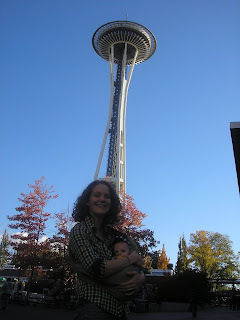 Thursday we went to another moms' group, and we met the baby that Cindie delivered 2 days before Ez! Today is a baby shower! He has new tricks these days. He has laughed 3 times quite obviously and had some half hearted attempts at it for Brendan this morning. He's starting to roll a little more from his back to his side. I'm working on more effective tummy time to strengthen his arms. I'll try my best to get some laughing on video once it becomes a more regular behavior. Ezra has now joined his mother in being a yoga fan. Brendan ordered Itsy Bitsy Yoga for us, and so far Ezra really seems to enjoy doing baby yoga with us. I think it is helping him to relax before bedtime, and it must also be aiding his digestion b/c we don't have nearly as many bouts with a fussy tummy these days. I love having more ideas for how to play with him, and I'm glad that I can know what all the little games and stretches are helping Ezra to learn or helping his body to do. Ezra's favorite pose? 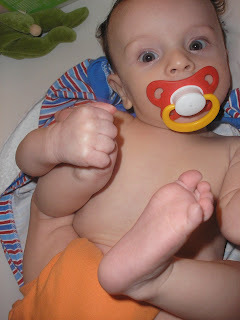 SUPER BABY! He also seems to like One Foot, Two Foot Lotus. I HIGHLY reccomend getting this book. Be ready to ignore whatever cheesy stuff bothers you (umm, imagine your heart glowing with your favorite color???? ), but overall it is really great.